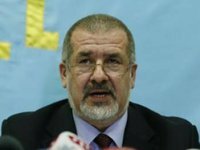 The Mejlis of the Crimean Tatar people are now aware of 75 female citizens of Ukraine with children in harsh conditions in Syria with destroyed infrastructure and seeking help in returning them to Ukraine, MP Refat Chubarov (Bloc Petro Poroshenko faction), Chairman of the Mejlis of the Crimean Tatar People has said. "Recently, the Mejlis of the Crimean Tatar people and me, as a Ukrainian deputy, began to receive appeals of women - citizens of Ukraine of different nationalities who, due to different life circumstances, turned out to be with young children in Syria, asking to help return them to Ukraine. Today the Mejlis of the Crimean Tatar people is aware about 75 people (21 women, 54 young children), who are located in difficult conditions in territories with destroyed infrastructure," Chubarov wrote on Facebook. He noted that the Mejlis of the Crimean Tatar people interacts with the Ministry of Foreign Affairs of Ukraine in order to assist citizens of Ukraine who find themselves in a difficult situation outside their country. "Since there are currently no diplomatic institutions of Ukraine in the Syrian Arab Republic, we ask those who have specific information about the cases of citizens of Ukraine staying in Syria, who are seeking protection from their own state and are not able to contact us, please inform us at Chubarov.Refat@rada.gov.ua," the MP wrote.